We were pleased to have Moose Peterson join us recently in the studio to talk to us about some of his new projects and share photo tips. We’ll have his interview released soon. But you can catch up and learn about his latest project on aviation photography. 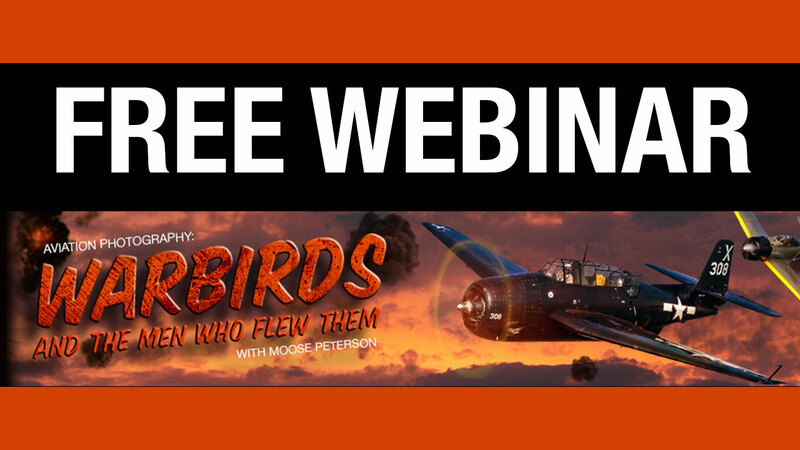 Join Moose Peterson, world-renowned wildlife and aviation photographer, alongside Scott Kelby, for a live webcast of the world premiere of Mooses latest project. Together theyll take us through this exhilarating documentary of two World War II pilots and the planes they loved and flew. Filmed on location with The Texas Flying Legends, this film beautifully captures the glory of these Warbirds in flight. You’ll experience the power and brilliant imagery of airplanes, such as P-51 Mustangs and B-25 Bombers, and you will see personal interviews with navigators, gunners, pilots and Tuskegee Airmen.